The 25 metre motor yacht Blue Symphonie, listed for sale by Maarten Ten Holter at Fraser Yachts, has been sold to a direct client in an in-house deal. 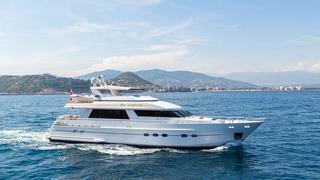 The motor yacht was built in steel and aluminium by Moonen in the Netherlands and delivered in 1995. She is a great example of the highly popular Frank Mulder designed 83 series and had been constantly upgraded and maintained by her previous owner. Blue Symphonie has accommodation for six guests in three cabins. The spacious owner’s cabin has an ensuite bathroom with a shower, bath, bidet and double sinks. There are also two guest cabins, in front of the engine room, which have two single berths each. The matching cabins also have ensuite showers and heads, and both have additional Pullman berths and a desk. She also has accommodation for two crew in one cabin, which has its own shower and head. There is also a crew pantry and crew storage. Blue Symphonie’s aft deck has an oval shaped teak dining table, which can seat four. In the salon there are creatively shaped settees on port and starboard side with a dining table opposite of the galley. On her sun deck she has a large dining and seating area, which can accommodate up to seven guests and has a grill, sink and fridge. The tender and crane are located on the aft section of the fly bridge deck. Blue Symphoniewas asking €675,000 with VAT paid.